Published in cooperation with the Ohio Township Association, the four-volume sourcebook series is intended to aid in township governance and management. Each sourcebook provides an informational resource for elected Township officials about the functions and duties of their position. 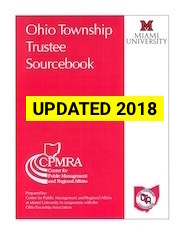 The Township Trustee Sourcebook examines responsibilities particular to the elected office of Township Trustee. As the other elected Township official, Fiscal Officers have a different set of responsibilities which are presented in the Township Fiscal Officer Sourcebook. The third volume in the sourcebook series provides an overview of the personnel management function and recommended policies and procedures. The Township Zoning Sourcebook is the latest addition to the Township Sourcebook Series and was first published in 2009. It is designed to provide township officials with an general overview of township planning and zoning, related issues and recommended practices. All sourcebooks were updated in 2013. 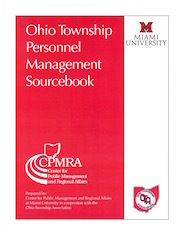 Ohio Township Personnel Sourcebook - You must purchase the 2013 Personnel Sourcebook to obtain the password to open and use this file. NOTE: All sourcebooks orders are processed by the Ohio Township Association. Please contact the OTA directly to submit your order and payment. CURRENT PRICING - Please visit the Ohio Township website to download an order form.